February 19, 2012: The University of Cambodia convened a special ceremony in the meeting room, attended by faculty, staff and students, to receive a donation of US $10,000 from Dr. Rikhi Thakral (Executive Director of the Thakral Group of Companies in Singapore) to further the development of UC and our students. The event was graced by the presence of H.E. Mr. Dinesh K. Patnaik, Ambassador Extraordinary and Plenipotentiary of the Republic of India to Cambodia, as a witness. In his introductory remarks, the UC President thanked Dr. Thakral for his most generous contribution, which would be used to help support the proposed new College of Media and Communications. 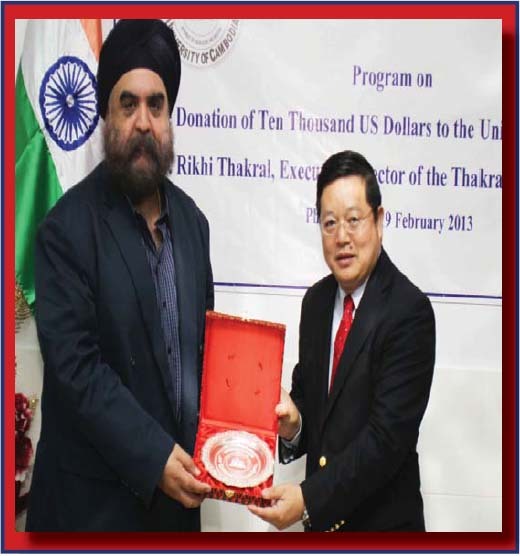 He noted that this was not the first time that Dr. Thakral had offered his support: previously, he had provided financial support for 100 scholarships to new University of Cambodia students (the Samdech Techo Hun Sen’s Vision-100 Scholarship for the period of 2008-2012), as well as other support to the University since 2003. H.E. Mr. Dinesh K. Patnaik continued by noting that this donation is indeed important because it is to further develop the educational sector of Cambodia, as an important factor for the promotion and progress of other industries”. Apart from this, he also mentioned several projects which the Government of India is involved with, including dams in Kandal province and Tasal’s water reservoir in Kompong Speu province. Moreover, the relationship between Cambodia and India has been developed and strengthened over a long period of time: thus the Government of India has frequently provided support to the Royal Government of Cambodia in the educational field. Dr. Rikhi Thakral then made a brief, humble speech in which he said he did not like making speeches; and that he was sure that the donated money would be put to a good use by UC to further the latter’s development. Visit of H.E. Mr. Enda Kenny, Former Prime Minister of Ireland, and Madame, to The University of Cambodia (UC). He will meet with the UC students. The UC Student Senate (UCSS) will hold its election on January 26, 2019, to elect its new leadership team. H.E. Ms. Felicidade de Sousa Guterres, Ambassador of Timor-Leste to Cambodia, will inaugurate the Timor-Leste Room on the 6th floor and deliver an ASEAN Ambassador Partner Lecture in the Conference Center from 9:10am-10:30am. Cambodia-India Scholarship Awareness Forum, at the Indian Room, 9th Floor, from 2:30 PM-4:30 PM. UC Student Senate 12 Mandate Election 2018, at 8:00 AM. The Inauguration of the Germany Room and ASEAN Ambassador Partners Lecture Series, at the UC Conference Center, at 9:00 am-11:00 am. The Center for English Studies (CES) at the University of Cambodia (UC) is pleased to announce that the 19th CES graduation ceremony is going to be held on March 23rd, 2018, at the Conference Center (fifth floor), at 2:00 PM. Workshop on “Cambodia’s Foreign Policy: Current Updates” from 8:30AM-12:00 PM, at the Cambodia Hall. The Inauguration of the Laos Room and The ASEAN Ambassador Lecture Series: The Relations between Laos and Cambodia at the Cambodia Hall from 9:00 AM- 11:30 AM. The Inauguration of the Sweden Room and The ASEAN Ambassador Partner Lecturer Series from 9:00 AM-11: 30 AM. The Distinguished Public Lecture on the Belt and Road Initiative: Benefits and Impacts at the China Room at 3:00 PM. The first issue of the UC Occasional Paper Series is now out! The Center for English Studies (CES) of The University of Cambodia(UC) is pleased to announce the 2nd Writing and Storytelling Competition 2017 to high school students and the 1st & 2nd year university students in Cambodia. Why should you participate in The Forum for Success? Phnom Penh, 07th June 2017, On behalf of The University of Cambodia, the Skills and Career Development Center (SCDC) would like to invite you to participate in the “How to keep students highly motivated in learning” short course, which will be held on Thursday, June 08, 2017 from 2:00 PM to 5:00 PM in Room 508, 5th floor. CES Register now and get a scholarship of 40% up! Announcement for All MA Students Who Plan to Graduate by November 2017. Workshop on “Accounting and Auditing” jointly organized by Ministry of Economy and Finance and UC, at 8:00 AM. UC invites you to attend a lecture on "The Future of ASEAN" by HE Ambassador-at-Large Bilahari Kausikan as part of our Distiguished Lecture Series. The Registration for Term III. Academic Year 2015-2016 is now open! Session VIII (A): Where To Study in Cambodia? : How to Choose The Best University to Study? Session VII (B): Education / Financial Aid: "Student Loan in Cambodia: Current Situation and Look Ahead"
Session VI: "How Your Education, Skills & Attitude May Influence Your Salary"
The University of Cambodia (UC)'s participation at The University Fair 2016 at the the Olympic Stadium. The University of Cambodia is offering 2000 scholarships for Academic Year 2016-2017. Please consult for more information about each of the scholarships offered. Ambassador’s Lecture Series “A Career in the Foreign Service” by Former Ambassador H. E. Brendan Scannell-Honorary Advisor, Ambassador Extraordinary and Plenipotentiary of Ireland in Copenhagen. We are Part of the Change. . . These used to be my Dreams…and I already made it! Promoting Road Safety to University of Cambodia Students Safety First! New term for The Center for English Studies (CES) at the University of Cambodia Learning English for a better future! UC Entrance Exam for AFD Students, Promotion 13, Term I, 24th November 2014. Visit to UC by Japanese University, JICA and RUPP, 21st November 2014. 5 April 2013 - Seminar on PATA Information and World Tourism Industry Trend organized by: College of Management in collaboration with PATA Cambodia Chapter. 7 April 2013 - UC celebrates Khmer New Year following the New Year Music and Youth Fund Raising Program. Phnnom Penh, July 7, 2013, Delegation from Institute of Southeast Asian Studies, Jinan University visits The University of Cambodia. The Ceremony to Confer the Honorary Doctorate Degree of KIIT University and KISS Institute to H.E.Dr. Kao Kim Hourn at SEA TV Studio Phnom Penh, 9th December 2013. UC Forum For Young Leaders, March 13, 2011. The Second China-ASEAN High School Students Summer Camp in Beijing, Xi\'an and Shanghai.